Product #16087 | SKU MBSV-SB-10DV | 0.0 (no ratings yet) Thanks for your rating! 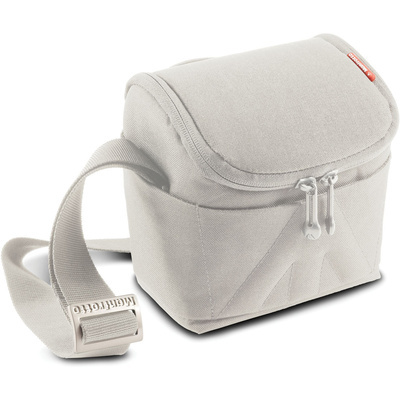 Stealthy, compact, attractive, minimal, water-resistant, and with all the features required for street or travel photography, the black Amica 10 Shoulder Bag from Manfrotto is designed to hold a mirrorless camera with an attached zoom lens and an additional pancake lens. A versatile bag, it has interior and exterior slip-in pockets for small accessories such as a cell phone, cables, and the like. Double zipper pulls provide for confident and water-repelling closure, while padded, touch-fastening dividers are useful for organising and protecting gear. Carry your Amica with the padded top handle or wide, adjustable shoulder strap.